Speaking alongside President Obama, Japanese Prime Minister Shinzo Abe offered condolences for the lives lost here in 1941. “I offer my sincere and everlasting condolences to the souls of those who lost their lives here, as well as to the spirits of all the brave men and women whose lives were taken by a war that commenced in this very place,” Abe said, adding that he was “rendered entirely speechless” when he contemplated the deaths of so many U.S. service members. Abe’s visit Tuesday with President Barack Obama is powerful proof that the former enemies have transcended the recriminatory impulses that weighed down relations after the war, Japan’s government said. 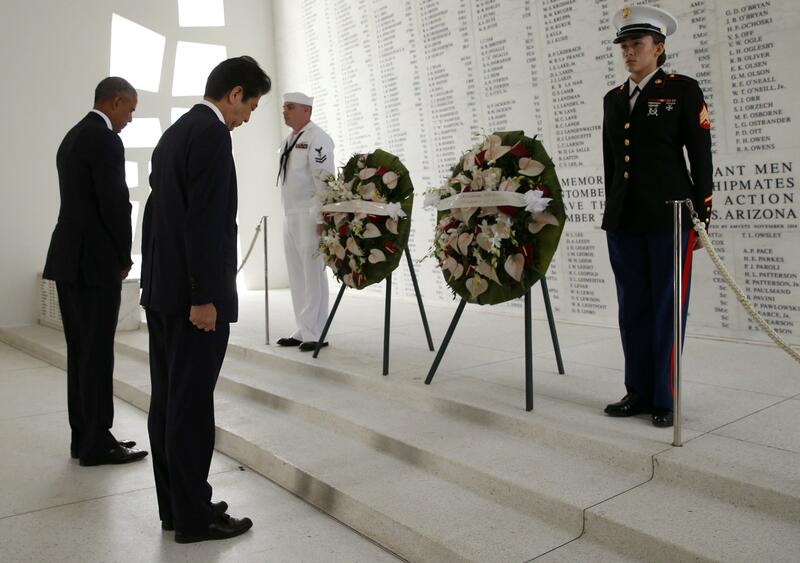 Although Japanese leaders have visited Pearl Harbor before, Abe became the first visit the memorial that now rests on the hallowed waters above the sunken USS Arizona. Abe did not apologize for Pearl Harbor. Nor did Obama apologize at Hiroshima in May, a visit that he and Abe used to emphasize their elusive aspirations for a nuclear-free future. After a formal meeting in the morning, Obama and Abe lay a wreath aboard the USS Arizona Memorial, which is accessible only by boat. Then they went to nearby Joint Base Pearl Harbor-Hickam, where both leaders will speak. Obama and Abe signed off on the visit last month when they met in Peru on the sidelines of an economic summit. Though the parallels with Obama’s Hiroshima visit are palpable, both governments said one visit wasn’t contingent on the other. Caroline Kennedy, the U.S. ambassador to Japan, told CBS News the mutual visit is about both nations finding peace. “I think that what they really are doing is showing their respect to those who sacrificed and I think that that’s really so powerful,” she said. During the campaign, Mr. Trump suggested that Japan and South Korea should obtain nuclear weapons so the U.S. would no longer be burdened with costs of defending them, a disquieting notion in many Asian capitals. But after Mr. Trump’s election, Abe became the first foreign leader to meet with him, sitting down in Trump Tower with the business mogul and Trump’s daughter, Ivanka. Though no other Japanese prime minister has visited the USS Arizona Memorial, former Japanese leader leader Shigeru Yoshida visited Pearl Harbor in 1951, six years after Japan surrendered. He stopped there on his way home from signing the San Francisco peace treaty with the U.S. and others, and paid a courtesy visit to the office of Adm. Arthur W.R. Radford.